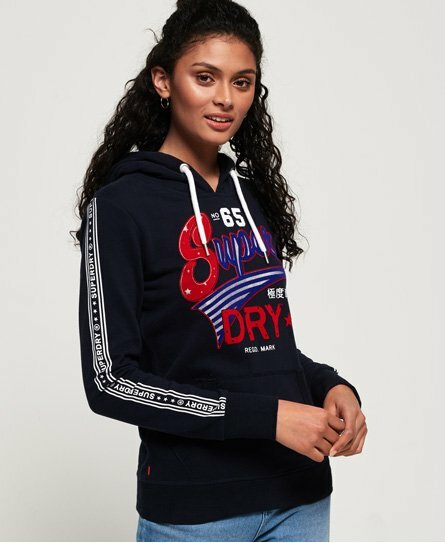 Superdry women's American script flock lite hoodie. This lightweight overhead hoodie is the perfect transitional wardrobe piece and features a drawstring adjustable hood, a front pouch pocket and a Superdry logo on the chest in a flocked effect. This hoodie also features Superdry logo detailing down the arms in a cracked finish and ribbed trims. The American script flock lite hoodie is completed with our signature orange stitch in one side seam and a Superdry logo tab in the other. Wear this hoodie with your favourite jeans and trainers for a casual look.